Updates to Fred's profile since your last visit are highlighted in yellow. 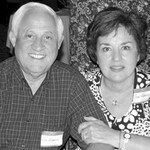 Fred and Carol Alberini of Warren celebrated their 50th anniversary on July 2, 2010. Mr. Alberini and the former Carol Ann Steines were united in marriage on July 2, 1960, at St. Mary's Catholic Church in Warren. The couple have four children: Mark (Susan) of Warren, Regina (Mark) Young of Jacksonville, Fla., Michael of Boardman and John of Avon. They also have five grandchildren.